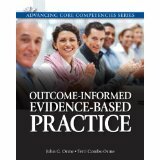 In this chapter we define the important terminology of Outcome-Informed Practice, using as examples the two cases presented in chapter 1. In addition, we discuss how OIP differs from research in critical ways, though it uses some of the tools of intervention research, including single-case designs. Finally, we discuss a little bit about the history and antecedents of Outcome-Informed Practice.